Can the U.S. celebrate the International Year of Family Farming (without embarrassment)? Promote policies in favor of the sustainable development of Family Farming by adopting concrete and operative measures and strategies, making budgetary allocations in support of Family Farming. Re-enforce the legitimacy of the farming associations to represent the interests of Family Farming in support of the making of farming policies. Increase awareness among civil society of the role of Family Farming. Achieve recognition of the role of women in Family Farming and of their rights. Advocate and defend an international economy of food products based on rules which foster development and food security in all countries. Promote investigation associated with sustainable rural development giving it human and financial resource. To achieve these objectives, representatives of Farmers’ Organizations five continents met in Abu Dhabi on January 21-22, 2014, with the intention of developing specific policy recommendations. 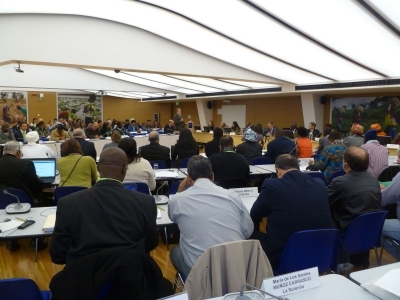 In the statement agreed during the meeting, the participants reaffirmed that “Family Farming can and must become the cornerstone of solid sustainable rural development, conceived of as an integral part of the global and harmonised development of each nation and each people while preserving the environment and natural resources”. “However, for this to be achieved Family Farming requires genuine public support which is non-existent today in most countries. A support which ensures the access to and control of land, water and other natural resources, to nearby markets, credit, investment and agricultural extension as well as equitable responses to the specific needs of rural women and youth”, emphasize farmers’ leaders. Family farming organizations agreed on five main demands to be forwarded to decision makers during the IYFF-2014. U.S. federal farm policy has been markedly pro agri-business and anti family farmer, in spite of the rhetoric of U.S.D.A. administrators. While this policy has resulted in cheap food (consumers in the U.S. expend less than 10% of their income on average toward food) the effect on all other aspects of society such as public health, environmental quality, rural community vitality, and the economic viability of the family farm has been decidedly negative. It will take a remarkable turn around in public policy in the U.S. if we intend to participate in the celebration that is the International Year of Family Farming! To learn more and support the New England chapter of the National Farmers Union, please consider joining this progressive voice in support of family farms. For a more complete story see: Will the International Year of Family Farming slow the “cancerous” growth of industrial farming?